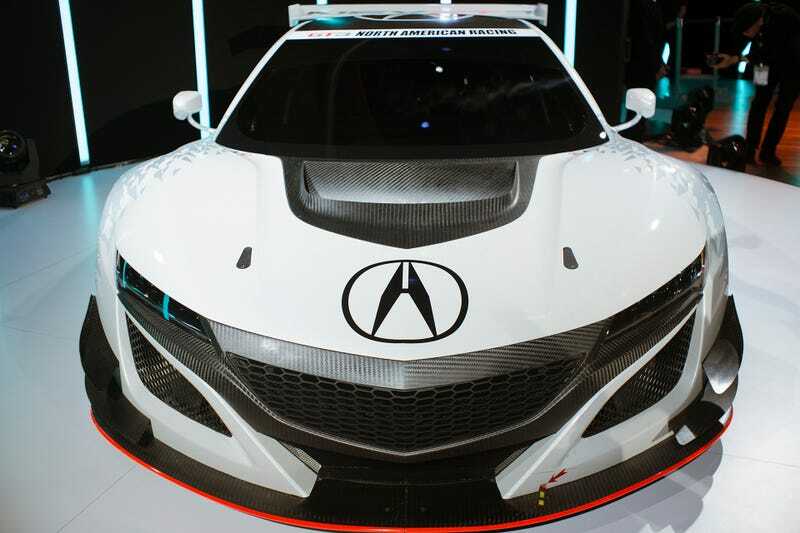 Acura will race the new NSX here in America as a GT3 car. That means no AWD, and that means no fancy hybrid tech. That sounds awesome! You’re looking at a high-power/high-downforce, low-weight/low-tech version of the regular NSX. It should be an enthusiast’s dream car. But this is a real bummer for Acura, which has made its electric-motor-enabled all-wheel drive a big part of the NSX’s identity. I spoke with Honda Motorsport’s boss Art St. Cyr and he did tell me that he had tried to get a hybrid version of the car into racing. At the very least, Acura was able to keep the rest of the engine pretty close to production-spec. The race engines share the same block, heads, crank, valvetrain, and dry sump oil system as the production motor, and both are built in the same facility in Ohio. Very cool. However, the FIA’s GT3 spec is really the only spec for you if you want to race a global sports car, and the FIA wouldn’t allow Acura to use AWD. They’ve said the same to Audi with their R8 and to Bentley with their Continental. St. Cyr also said the FIA didn’t like the hybrid stuff as they didn’t know if all the people involved really knew how to deal with hybrid drive, and they were concerned about keeping costs down. Though Acura will only race the NSX GT3 car in the U.S. starting in the 2017 season (Acura is pretty much an American car brand at this point), they still had to go with the FIA, St. Cyr told me. St. Cyr admitted even spoke to a couple different sanctioning bodies in an attempt to make the hybrid AWD thing happen, but he wouldn’t tell me which ones they were. “It’s not NASCAR,” was as much as he’d tell me.